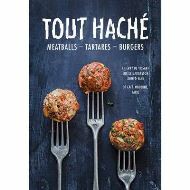 Tout Hache: meat chopped, minced or ground - but not only meat. Many countries have a fine tradition of mixing and binding an array of ingredients to create simple but delicious dishes, whether chopped up finely as tartare, fashioned into burgers or rolled into meatballs, boulettes or dumplings. Borrowing from such global culinary heritage and inspired by the popularity of street food and New York-style delicatessens, the team behind Cafe Moderne in Paris reinvents in Tout Hache the modest meatball in a surprising number of variations. Here you'll find appealing recipes using beef and lamb, of course, but also tuna, salmon and prawns. Discover such aromatic combinations as Veal Boulettes with Herbs, Chicken Boulettes with Sesame, Lebanese-style Steak Tartare, Tartare of Shrimp, Mango and Coconut Milk, and - for those with an even sweeter tooth - Chocolate Coconut Truffles. 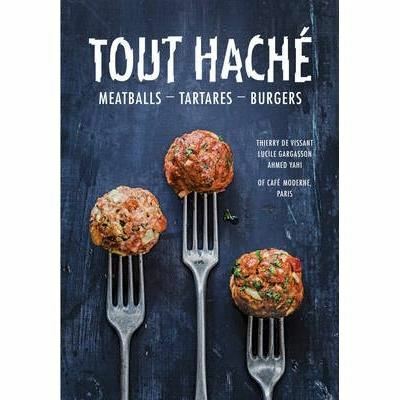 Proving that there's more to meatballs than tomato sauce, this stylish collection of over 30 recipes also features a variety of sauces and accompaniments, including creamed polenta, classic frites and mixed fried vegetables.